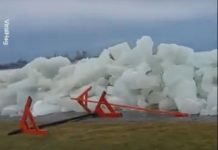 This video compilation of ice tsunami around the world is amazing. Enjoy! 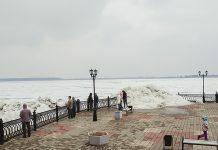 An ice shove is a surge of ice from an ocean or large lake onto the shore. 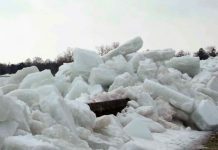 Such shoreline ice pileups are caused by ocean currents, strong winds, or temperature differences pushing ice onto the shore, creating piles up to 12 metres (40 feet) high. Some have described them as ‘ice tsunamis’, but the phenomenon works like an iceberg. Ice shoves can damage buildings and plants that are near to the body of water. Don’t think I have ever seen one of these In real life. I hope u ice fisher men can walk around or over it. Florida International University brand new bridge collapsed. Following site has the video of the pedestrian bridge before collapsed. The bridge looked stylish but heavier than some other pedestrian bridge. I myself walked pedestrian bridge to the elementary school to send my kids every day some years ago. I never imagined the bridge could collapse any time. But KARMA played really hard recently for clearing KARMA on the Earth. Any university or college is the part of the reptilian entity to teach 3rd dimension MATRIX with high tuition. The high tuition makes students deep in debt so that they are going to be debt slaves after they graduate. Many human with high education cannot find a job to pay out their student loan. Yes, the higher education make you a slave and a prisoner of MATRIX (Lies and Illusion), called education. This chemical plant might be producing CHEMTRAIL. Many of chemtrail factory also produce kids paint, food processing, some other common product in order to disguise as an ordinary factory. But they don’t tell you what is their main product that is chemtrail over your sky. They spray you many kinds of toxic ingredients including human blood from high in sky. Today, on USGS earthquake map with all magnitudes, there are 3 EXPLOSIONS. Next one is very near the Round Mountain Gold Mine, but it was not mine blast. If this is the mine blast, USGS express as mine blast. Coordinates are 38.637°N 117.100°W. M1.3 explosion with depth 3.1km. As I mentioned before, a huge gold mine means also a huge secret underground base. Yes, this was a shadow government (=reptilian) secret underground base explosion. The last one is an explosion near Ivanpah Solar Electric Generating System in Mojave Desert. M1.5 Explosion with 1.1km depth. Coordinates are 35.471°N 115.526°W. The explosion happened at the entrance of a huge quarry (=Reptilian secret underground base). Near here, there are huge Solar Arrays called Solar Electric Generating System. Solar energy are used for their underground bases. SECTION 9 AGENT TOGUSA SAYS: I wonder if a iceberg or ice tsunami has ever destroyed or damaged a submarine?